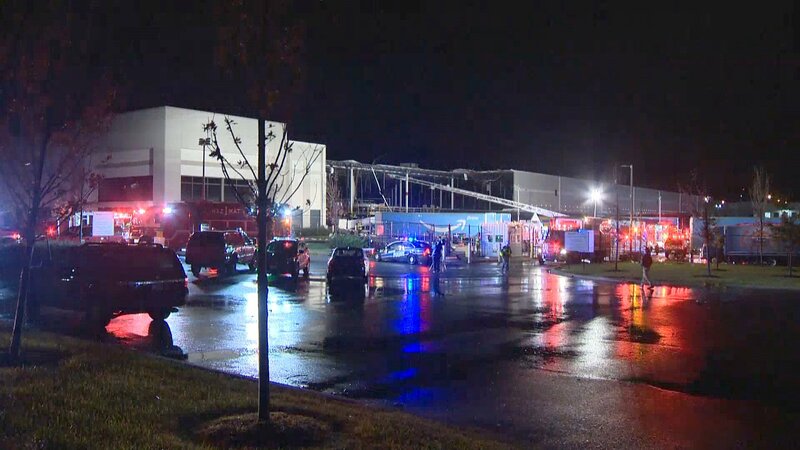 In the wake of Friday night's severe weather, a wall collapsed at an Amazon warehouse building in Baltimore, causing two fatalities. Two people were killed when a wall collapsed at an Amazon sorting facility in Baltimore on Friday night. The 50-by-50-foot exterior wall came down around 10:25 p.m. as a violent storm raged outside the building. "I was standing inside the building and me and one of the facilities dudes were talking, and I went to the left side of the building and he went to the right, and all of a sudden, we just heard these loud noises," Amazon employee Brandon McBride told WBAL. "The power shut off. It was just crazy inside. It just sounded like bombs were dropping everywhere. The whole side (of the building) was just dropping. ... There was stuff falling everywhere, you could see the walls were caving in. Rain was pouring everywhere; all the packages were soaked. It's unreal." One employee was pulled out from under the debris by rescue crews and transfered to a local hospital where he later died. Amazon employees also reported that another employee was unaccounted for, so the Baltimore Fire Department worked all night to remove debris. They discovered a second deceased victim on Saturday morning, Baltimore Fire Chief Roman Clark said. No other injuries were reported. "This evening, severe weather damaged one of our facilities in Baltimore City," Amazon's regional manager of external communications, Rachael Lighty, said in a statement. "Our thoughts go out to all families impacted by this evening's severe weather." Dave Clark, Amazon's senior vice president of operations, also released a statement Saturday morning: "Last night, severe weather impacted one of our facilities in Baltimore City resulting in two fatalities. First responders remain onsite assessing the damage. The safety of our employees and contractors is our top priority and at this time the building remains closed. We are incredibly thankful for the quick response from emergency services. Our thoughts and prayers go out to the families impacted by Friday evening's tragic event." The National Weather Services is looking into the situation to see if the heavy storms may have produced a tornado. A local TJ Maxx lost part of its roof Friday night, and there were multiple downed trees and power lines in the area. Did your home receive any damage in last night's severe storms? Feel free to post your pictures in the comments! Our thoughts and prayers go out to the two families who lost loved ones in this incident. The Ocean Pines Fire Department granted a terminally ill woman's request to see the Ocean City beach one last time. Read the heartwarming story here.